BY High School Building in 1921. Henry Dixon "Hank" Taylor Jr., President of the Brigham Young High School Class of 1949, recently learned that his father, Henry Dixon Taylor, Sr., may have also graduated from BYH. To determine whether this was true, he decided to review one of his father's books, The Autobiography of Henry D. Taylor. This 396-page book was self-published by his father and printed by the BYU Press on January 1, 1980. Copies are rare. Not only did the book confirm that Elder Henry D. Taylor is a graduate of BYH, Class of 1921, but also included in the book are two remarkable BYH group photographs. 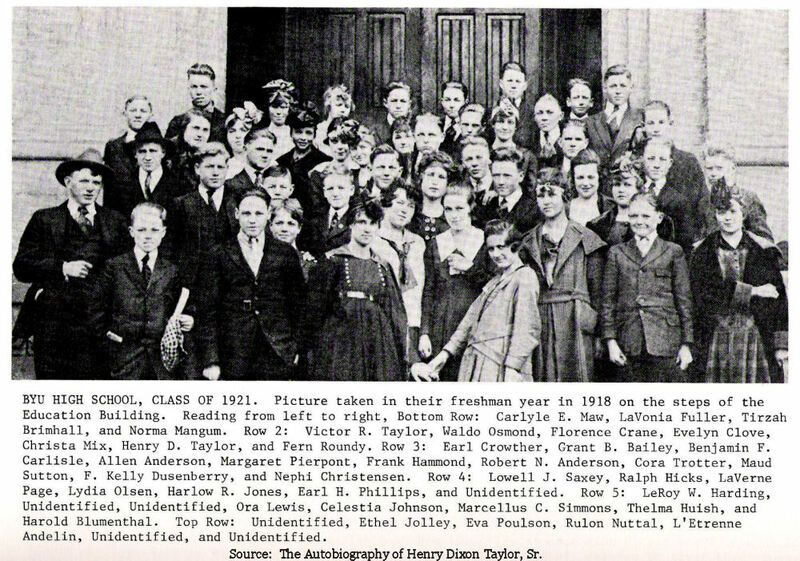 The first group photo shows the members of the Class of 1921, but as they appeared when they were young freshmen -- that is, 8th graders -- in 1918! The second photo shows the Class of 1921 as dignified graduates, holding their diplomas and posing with their principal, William H. Boyle, Jr. 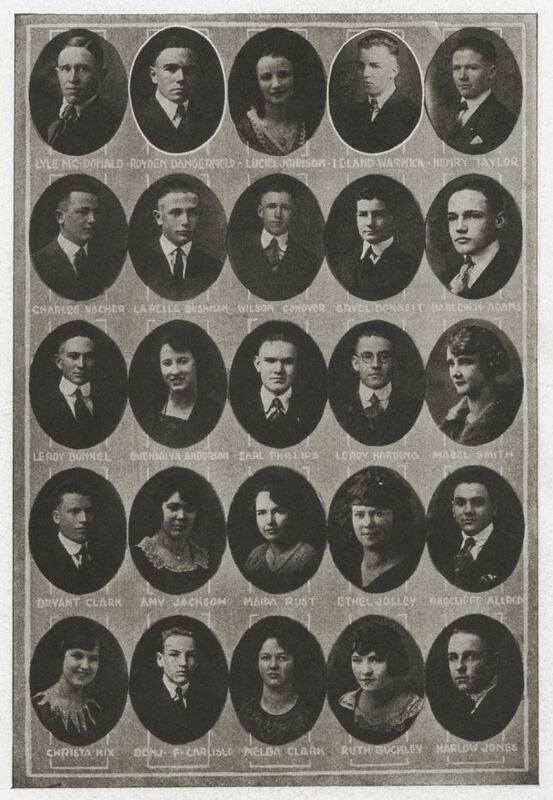 When we later found other lists of 1921 graduates, it appears that approximately half of the new grads made it to the photo-taking session. These rare photographs are a precious part of the history of Brigham Young High School. We are grateful to Hank Taylor '49 for finding, scanning, and sending them to us so the alumni and friends of BYH can enjoy them. Because of this contribution to this website, two additional photo pages of the Class of 1921 were found, this time in the 1921 BYU Banyan yearbook, BYH section. 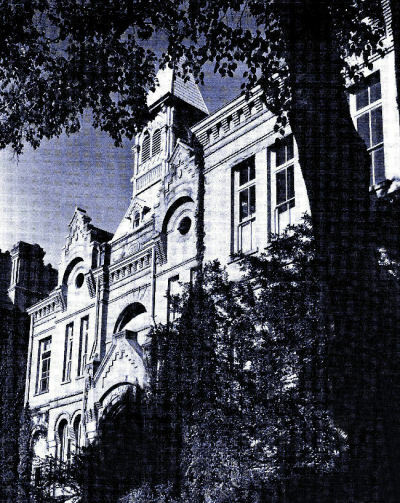 BYU High School, Class of 1921. Picture taken in their freshman year in 1918 on the steps of the Education Building. Left to right. Move your cursor over the photo to reveal one system of numbering. First Row: 1. Carlyle E. Maw. 2. Lavonia Fuller. 3. Tirzah Brimhall. 4. Norma Mangum. Second Row: 5. Victor R. Taylor. 6. Waldo Osmond. 7. Florence Crane. 8. Evelyn Clove. 9. Christa Mix. 10. Henry D. Taylor. 11. Fern Roundy. Third Row: 12. Earl Crowther. 13. Grant B. Bailey. 14. Benjamin F. Carlisle. 15. Allen Anderson. 16. Margaret Pierpont. 17. Frank Hammond. 18. Robert N. Anderson. 19. Cora Trotter. 20. Maud Sutton. 21. F. Kelly Dusenberry. 22. 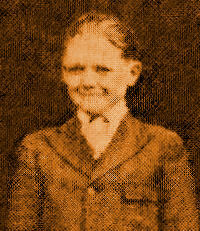 Nephi Christensen. Fourth Row: 23. 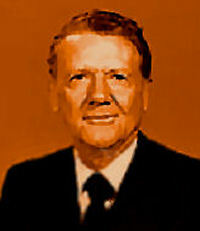 Lowell J. Saxey. 24. Ralph Hicks. 25. LaVerne Page. 26. Lydia Olsen. 27. Harlow R. Jones. 28. Earl H. Phillips. 29. Unidentified. Fifth Row: 30. 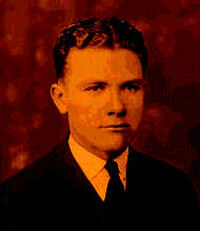 LeRoy W. Harding. 31. Unindentified. 32. Unidentified. 33. Ora Lewis. 34. Celestia Johnson. 35. Marcellus C. Simmons. 36. Thelma Huish. 37. Harold Blumenthal. Sixth (Back) Row: 38. Unidentified. 39. Ethel Jolley. 40. Eva Poulson. 41. Rulon Nuttal. 42. L'Etrenne Andelin. 43. Unidentified. 44. Unidentified. 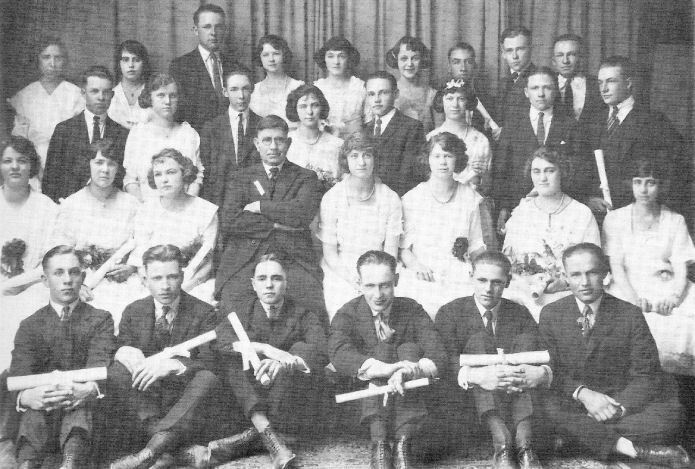 BYU High School's graduating class, photographed in the Spring of 1921. Left to right. Move your cursor over the photo to confirm numbering. First Row: 1. Raymond Holbrook. 2. Bryant Clark. 3. Raymond Dangerfield. 4. Ralph Kerr. 5. J. Knight Allen. 6. Ernest L. Miner. Second Row: 7. Melba Clark. 8. Amy Jackson. 9. Maida Rust. 10. William H. Boyle, Jr., Principal. 11. Elva Crosbie. 12. Ethel Jolley. 13. Edith Olsen. 14. Katie Swartfager. Third Row: 15. Leland Warnick. 16. Ivy Nielson. 17. Olin Zabriskie. 18. Melba Backman. 19. Harlen Adams. 20. Natella Lewis. 21. Henry D. Taylor. 22. Royal Chamberlain. Fourth (Back) Row: 23. Marvel Clark. 24. Unidentified. 25. Harlow Jones. 26. Atha Bateman. 27. Celestia Johnson. 28. Thelma Huish. 29. Truman Partridge. 30. Hugh Dougall. 31. J. Hunter Manson. Unfortunately, one young lady in the graduation photo [#24] remains unidentified. Perhaps we can match her photo to one of the photos that follow. One guess: Melva Porter. 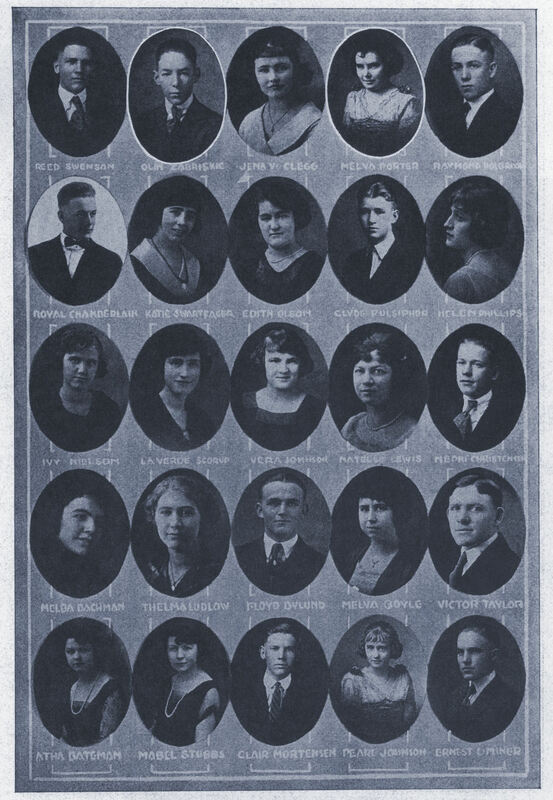 The above two pages show a total of 50 of 58 known BYH students in the graduating Senior Class of 1921. There may be additional official graduates in that class. Click on the above two pages for larger versions. 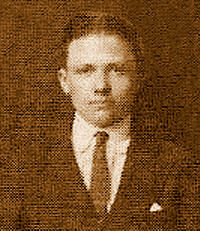 Henry Dixon Taylor, Sr., as a freshman at BYH in 1918, BYH senior in 1921, LDS missionary in mid-1920s, and as a General Authority.